Google Nexus 10 launches as 'highest resolution tablet on the market' | What Hi-Fi? 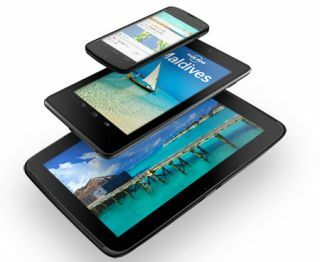 Google and Samsung have confirmed the launch of the Nexus 10, the biggest tablet in the Google Nexus family. The new Nexus 10 is a 10in tablet unsurprisingly, and joins the 7in Nexus 7 tablet and sits above the newly-launched Nexus 4, which has a 4.7in screen. Billed as a "premium entertainment device", the Nexus 10 is "the highest resolution tablet on the planet", thanks to a 2560 x 1600 resolution, which boasts over 4 million pixels and 300 pixels per inch (PPI). Battery life is claimed to deliver nine hours of video playback and more than 500 hours of standby time. The Nexus has the latest Android 4.2 Jelly Bean OS, also present on the Nexus 4, with new and updated Google apps includig Google Now and Google Maps. The Nexus 10 release date is November 13th, when it will go on sale via the Google Play Store in the UK. Prices are £319 for the 16GB wi-fi model, £389 for the 32GB wi-fi one.